Description: "Father Abraham had many sons . . ." So goes the chorus that the Shona people learned from European missionaries as part of the broader experience of colonization that they share with other African peoples. Urged to abandon their ancestors and embrace Christianity, the Shona instead engaged in a complex and ambiguous negotiation of ancestral myths, culture, and power. Israel Kamudzandu explores this legacy, showing how the Shona found in the figure of Abraham himself a potent resource for cultural resistance, and makes intriguing comparisons with the ways the apostle Paul used the same figure in his interaction with the ancestry of Aeneas in imperial myths of the destiny of the Roman people. The result is a groundbreaking study that combines the best tradition-historical insights with postcolonial-critical acumen. Kamudzandu offers at last a model of multi-cultural Christianity forged in the experience of postcolonial Zimbabwe. Citation: David M. Crump, review of Israel Kamudzandu, Abraham Our Father: Paul and the Ancestors in Postcolonial Africa, Review of Biblical Literature [http://www.bookreviews.org] (2014). 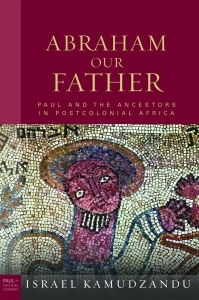 Citation: Daniel Darko, review of Israel Kamudzandu, Abraham Our Father: Paul and the Ancestors in Postcolonial Africa, Review of Biblical Literature [http://www.bookreviews.org] (2014).